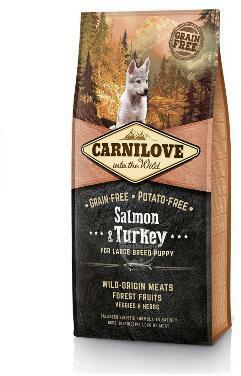 Carnilove Large Breed Puppy Food. Forest fruits, vegetables, wild berries, and herbs are natural sources of important vitamins, antioxidants and other essential nutrients. We’ve designed Carnilove with careful consideration for the historical continuity of cohabitation between dogs and humans. The ingredients and their proportion have been developed according to the diet of dogs prior to the advent of agriculture, but production is based on the latest processes and technologies. Composition: salmon meal (25%), turkey meal (20%), yellow peas (18%), chicken fat (preserved with tocopherols, 9%), sal – mon deboned (6%), chicken protein hydrolyzed (5%), tapioca starch (5%), apples (3%), chicken liver (3%), salmon oil (2%), carrots (1%), flaxseed (1%), chickpeas (1%), hydrolyzed crustacean shells (a source of glucosamine, 0,031%), cartilage extract (a source of chondroitin, 0,019%), brewer´s yeast (a source of mannan-oligosaccharides, 0,018%), chicory root (a source of fructo-oligosaccharides, 0,012%), yucca schidigera (0,011%), algae (0,01%), psyllium (0,01%), thyme (0,01%), rosemary (0,01%), oregano (0,01%), cranberries (0,0008%), blueberries (0,0008%), raspberries (0,0008%).